(BOSTON) — From the tension of contracting muscle fibers to hydrodynamic stresses within flowing blood, molecules within our bodies are subject to a wide variety of mechanical forces that directly influence their form and function. By analyzing the responses of single molecules under conditions where they experience such forces we can develop a better understanding of many biological processes, and potentially, develop more accurately acting drugs. But up until now experimental analysis of single molecule interactions under force have been expensive, tedious and difficult to perform because it requires use of sophisticated equipment, such as an atomic force microscope or optical tweezers, which only permit analysis of one molecule at a time. Now, a research team led by Wesley Wong at Harvards Wyss Institute for Biologically Inspired Engineering and Boston Childrens Hospital has made a major advance by developing an inexpensive method that permits analysis of the force responses of thousands of similar molecules simultaneously. They report in Nature Communications how programmable DNA nanoswitches can be used in combination with a newly designed miniaturized Centrifuge Force Microscope (CFM) as a highly reliable tool to observe thousands of individual molecules and their responses to mechanical forces in parallel. “This new combined approach will allow us and others to examine how single molecule complexes behave when they are thrown out of their equilibrium by the tunable force generated in our newly designed CFM. 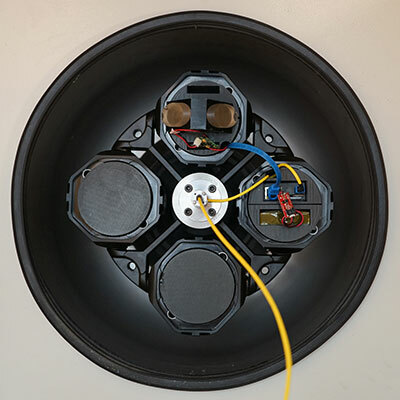 By basing this instrument on something that most researchers already have and use — the benchtop centrifuge — we hope to make single-molecule force measurements accessible to almost everyone,” said Wong, Ph.D., who is a Wyss Institute Associate Faculty member and the studys senior author. He is also Assistant Professor at Harvard Medical School in the Departments of Biological Chemistry & Molecular Pharmacology and Pediatrics, and Investigator in the Program in Cellular and Molecular Medicine at Boston Children’s Hospital. Earlier efforts led by Wong at the Rowland Institute at Harvard introduced the first CFM in 2010, which was a highly specialized instrument that carried out high-throughput precision force measurements on single molecules by tethering them to beads and pulling at them using centrifugal force. In his latest CFM iteration, Wong and his team developed a way to carry out the same technique with similar precision using a small inexpensive microscope made from easy-to-assemble elements and 3D printed parts that can be inserted into the swinging bucket of a standard benchtop centrifuge found in virtually all biomedical research laboratories. In addition, the team increased the robustness and accuracy of the assay by integrating thousands of so-called DNA nanoswitches, linear DNA strands with pairs of interacting molecules that are associated with two sequences in their middle and that, in addition, by binding to each other create an internal DNA loop; the nanoswitches ends are tethered to the surface of the sample on one side and to beads on the other. “By applying a defined range of centrifugal forces to the beads we can provoke the rupture of the molecular complexes generating the looped DNA structures which will be registered by the camera-coupled lens. Importantly, using DNA nanoswitches as a stable scaffold allows us to repeat this process multiple times with the very same molecule in temperature-controlled conditions which greatly enhances our accuracy in determining the heterogeneity that a single molecular interaction can display,” said Darren Yang, the first author of the study and a Graduate Student in Wongs team. In future research, bead-associated DNA nanoswitches can be employed to repeatedly assemble and rupture many different biomolecular complexes and to define the mechanical forces that control them. “The integrated DNA nanoswitches are very modular, and can be functionalized with many different biomolecules in essentially a plug-and-play fashion, to enable a wide variety of molecular interactions to be studied with high throughput and reliability,” added Wong. Next, the Wyss scientists are planning to apply their DNA nanoswitch-enhanced miniature CFM to the investigation of select biomedically relevant and force-dependent molecular interactions such as protein interactions governing blood clotting or hearing. “Wongs team has created a new technology platform that greatly reduces the cost of single molecule force analysis and makes it widely accessible to the scientific community. In addition to increasing our understanding of basic molecular structure-function relations, it may prove to be a valuable tool for drug development,” said Wyss Institute Founding Director Donald Ingber, M.D., Ph.D., who is also the Judah Folkman Professor of Vascular Biology at Harvard Medical School and the Vascular Biology program at Boston Childrens Hospital, and Professor of Bioengineering at SEAS. Harvard Medical School (http://hms.harvard.edu) has more than 7,500 full_time faculty working in 11 academic departments located at the School’s Boston campus or in one of 47 hospital_based clinical departments at 16 Harvard_affiliated teaching hospitals and research institutes. Those affiliates include Beth Israel Deaconess Medical Center, Brigham and Women’s Hospital, Cambridge Health Alliance, Boston Children’s Hospital, Dana-Farber Cancer Institute, Harvard Pilgrim Health Care, Hebrew Senior Life, Joslin Diabetes Center, Judge Baker Children’s Center, Massachusetts Eye and Ear Infirmary, Massachusetts General Hospital, McLean Hospital, Mount Auburn Hospital, Schepens Eye Research Institute, Spaulding Rehabilitation Hospital and VA Boston Healthcare System. Boston Children’s Hospital (http://www.childrenshospital.org) is home to the world’s largest research enterprise based at a pediatric medical center, where its discoveries have benefited both children and adults since 1869. More than 1,100 scientists, including seven members of the National Academy of Sciences, 14 members of the Institute of Medicine and 14 members of the Howard Hughes Medical Institute comprise Boston Children’s research community. Founded as a 20_bed hospital for children, Boston Children’s today is a 395_bed comprehensive center for pediatric and adolescent health care. Boston Children’s is also the primary pediatric teaching affiliate of Harvard Medical School. For more information about research and clinical innovation at Boston Children’s Hospital, visit: http://vectorblog.org.